I am always on the lookout for something old and beaten up that I can turn into something totally different. 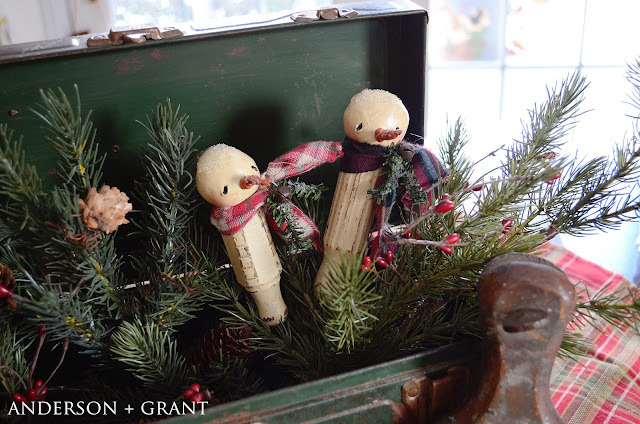 These snowman screwdrivers do just that! I was shopping at a store called Surplus City, outside of Altoona, PA. 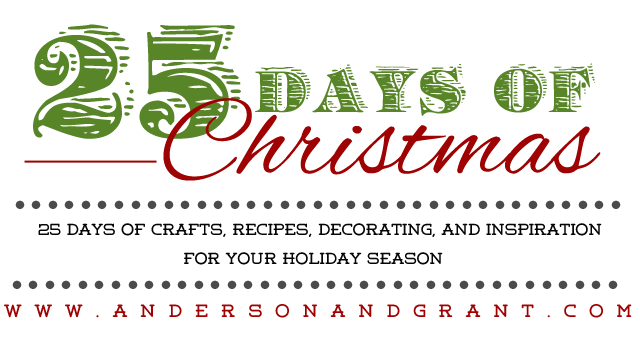 They have an enormous amount of craft supplies, home decor, and tools. (Perfect store for husbands and wives to shop in together!!!!) I was wandering through the tool section and came across a whole bucket full of rusty vintage screwdrivers.....3 for a $1!!! Who could turn down that deal? I bought a bunch and immediately my mind was going trying to figure out what I could create. 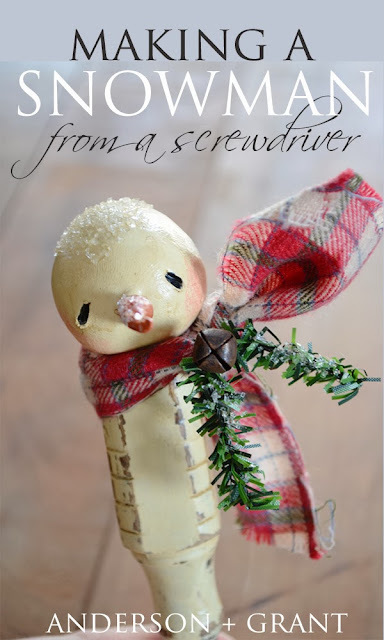 I decided that an old, worn out screwdriver could take on another life as snowman. 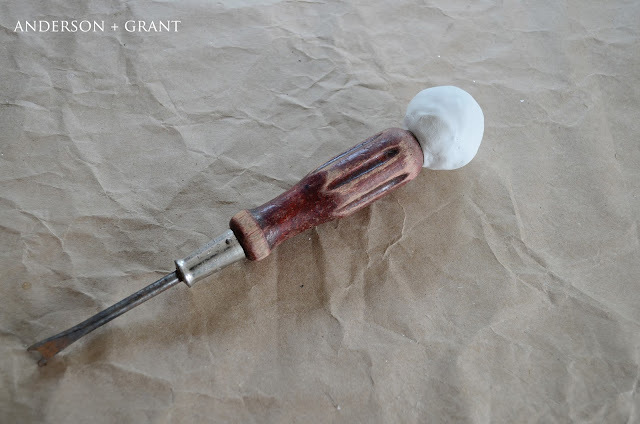 You can pick up old wooden handled screwdrivers like these in lots of places....I've seen them in thrift stores, antique stores, yard sales. You could also use a newer screwdriver for a little bit more modern look. 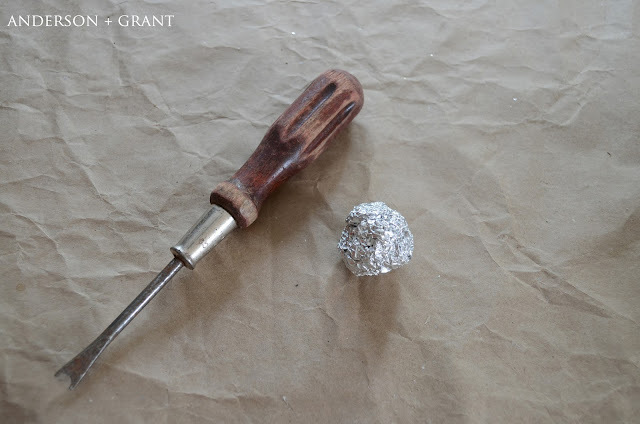 Begin by making a ball out of the foil that is slightly smaller than you want the snowman's head to be. Then cover the foil ball with a thin layer of the oven-bake clay. 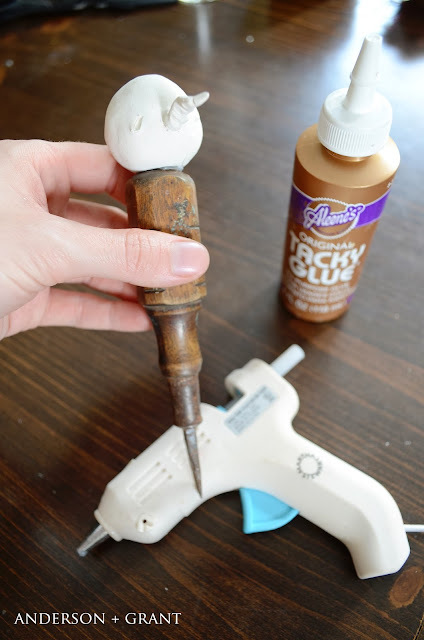 Press the clay ball down on the top of the screwdriver....since most screwdrivers have rounded tops, you'll need to make sure the clay forms to the top of the screwdriver. Otherwise, it will not glue together well after the head is baked. I used a small plastic crate to hold my screwdriver upright while creating the snowman's face. Form a nose out of some more of the clay. After I get the shape and size I'm looking for, I like to twist and pinch the nose in places to give it a little character. You'll want to dig a little bit of the clay out of the snowman's face where the nose will be going in. That way the nose gets pushed into the face and everything bakes together. I have a sculpting tool to do this, but you could also use a toothpick. 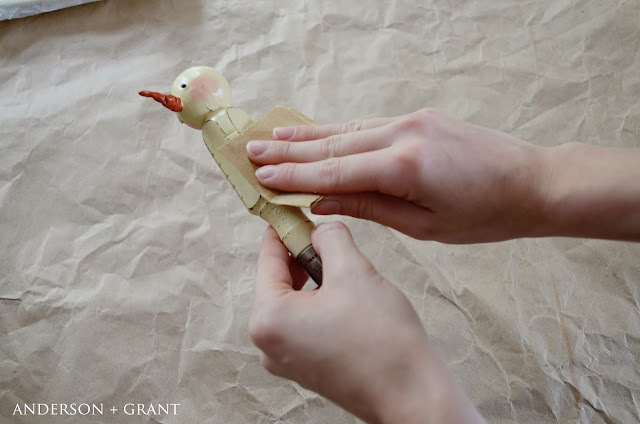 Use the same tool to carve two eyes into the face, wherever you'd like them placed. Bake the head according to the directions on the package of clay. My screwdrivers were mostly all different. Since the head was formed to the top of the screwdriver, I had to keep the heads and screwdrivers in order so that I knew which ones went together. Keep this in mind if you are making more than one snowman. 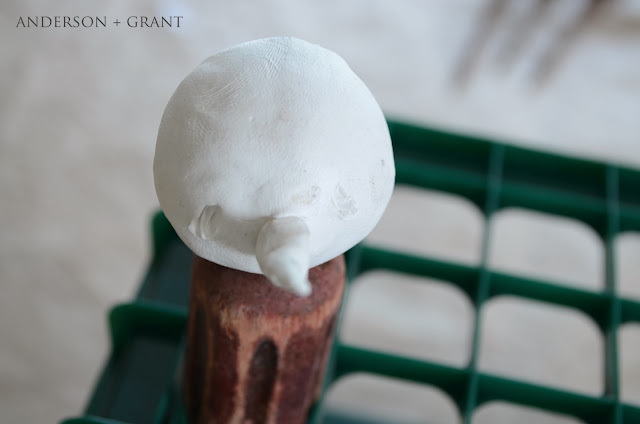 After the head comes out of the oven and cools, glue it onto the screwdriver base. I covered the base of the head with craft glue, but also added a small amount of hot glue to hold the head in place until the craft glue dried. It has a tendency to slide around a bit since the head of the screwdriver is round. 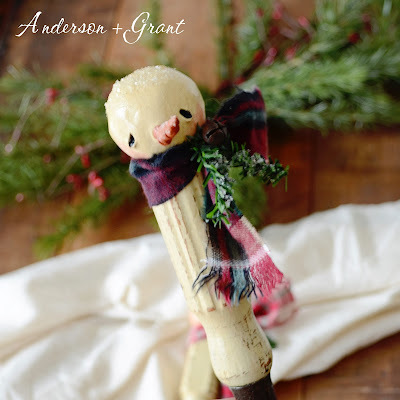 Paint the wooden handle of the screwdriver and snowman's head with a creamy white color. Paint the nose with orange and the eyes with black. To get rosy cheeks, lightly dampen the check area with water, pat the water off, and then color the cheeks with the red-orange colored pencil. (You could also use pink). 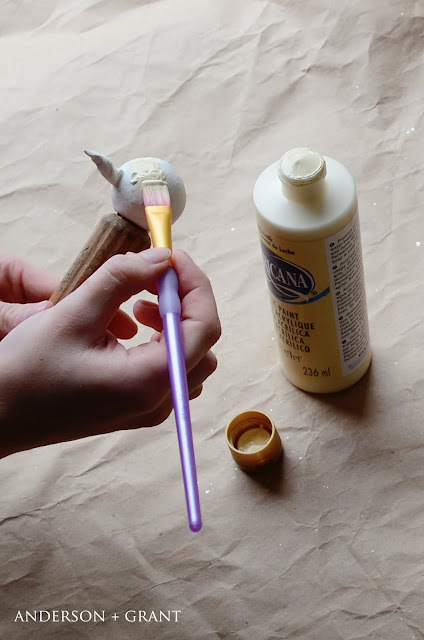 Use your finger to blend the colored pencil so that it doesn't look colored on. Make sure that the cheek is almost dry or the color will just wipe off when you try to blend it. Sand the handle of the screwdriver in spots to make it look a little worn. 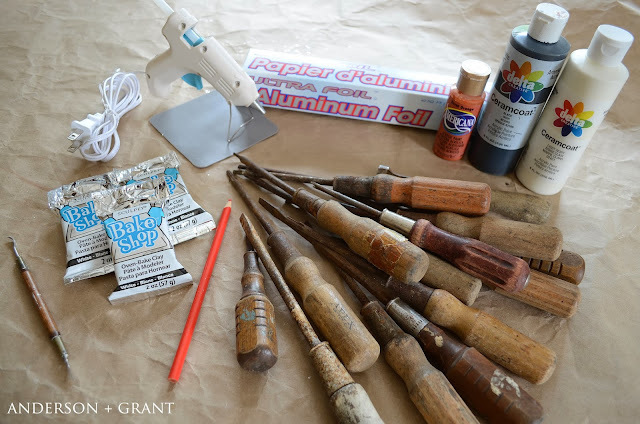 Coat the entire piece, including the metal of the screwdriver with some kind of sealer....either an acrylic craft sealer or polyeurethane. This will keep the metal from getting anything else dirty or rusty. 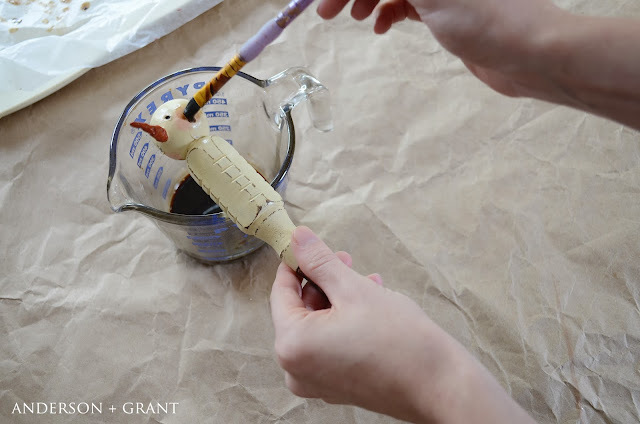 Mix up some strong instant coffee to antique the snowman. Brush the coffee on and let it air dry. The coffee will soak in and give you a nice primitive, vintage look. If you end up with too much staining, use a little bit more coffee when it is dry to brush it all out. 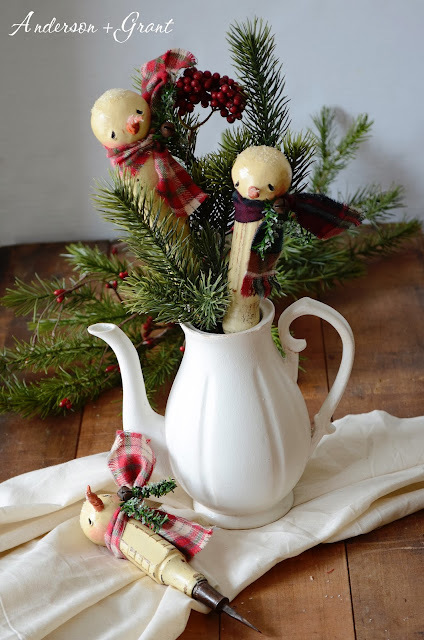 Tie a scarf around the snowman's neck and attach a tiny jingle bell and piece of greenery with some floral wire. 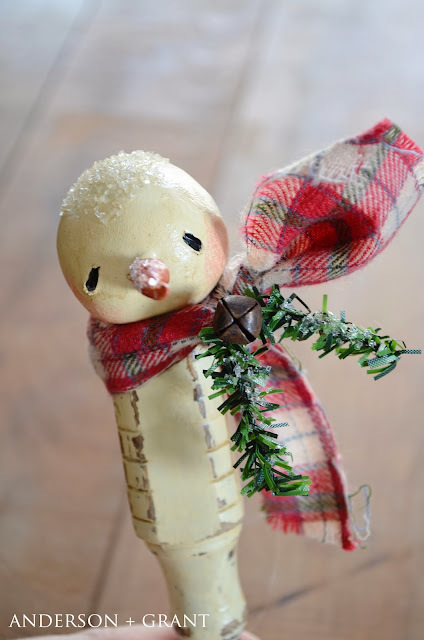 Use Mod Podge to add a little glass glitter to the snowman's head and nose and a little on the greenery. This adds a little sparkle to your snowman. And now you're done! 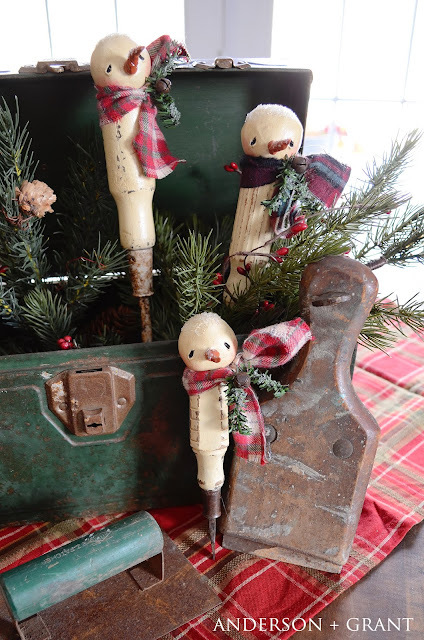 I set up a display in an old green toolbox filled with a little greenery and added a few more old, rusty tools to the vignette. What do you think? I have some of these available for sale in my Etsy shop if you'd rather buy than create....you can buy a set of three with a teal blue scarf, a red plaid scarf, or message me and I can set up a combination of the two colors.